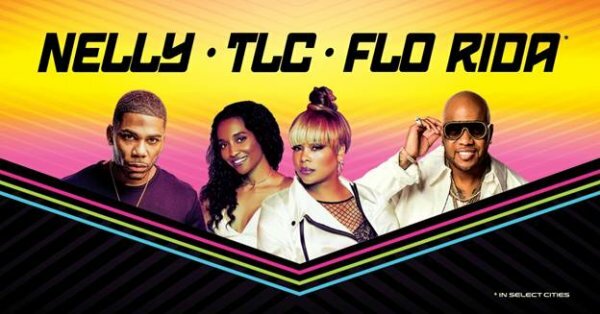 (Mar 11, 2019)– Music iconsNelly, TLC,andFlo Ridahave announced they will be hitting the road together for an epic tour across North America. The Billboard chart-topping hitmakers will join forces to bring a show like no other to outdoor amphitheater stages all summer long. Fans can expect an incredible, non-stop party with each artist delivering hit after hit all night long. Produced by Live Nation, the 21-city outing will kick off July 23 in Tuscaloosa, AL at Tuscaloosa Amphitheater and make stops in Atlanta, Toronto, Detroit, Austin and more before wrapping August 31 in Irvine, CA at FivePoint Amphitheatre. Nelly, TLC and Flo Ridawill play PNC Music Pavilion Charlotte on Friday July 26 and Coastal Credit Union Music Park Raleigh on Saturday July 27. Win Nelly, TLC, and Flo Rida Tickets! Enter for the chance to win a pair of tickets to see Nelly, TLC, and Flo Rida at PNC Music Pavilion Charlotte on Friday July 26!